Every month, all our FFOZ Friends receive a special newsletter and an exclusive teaching of the month. 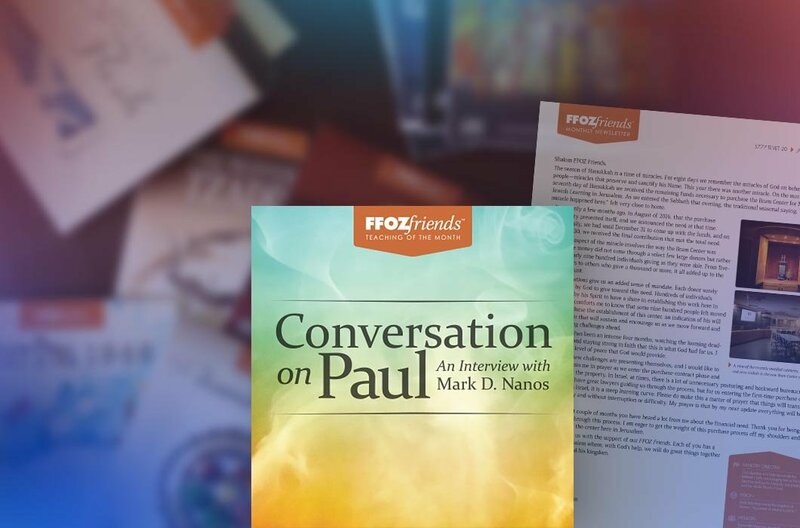 The January newsletter recounts an exciting close to 2016 for the ministry, and the teaching of the month introduces our FFOZ Friends to Jewish scholar Mark D. Nanos, an expert in Pauline studies. 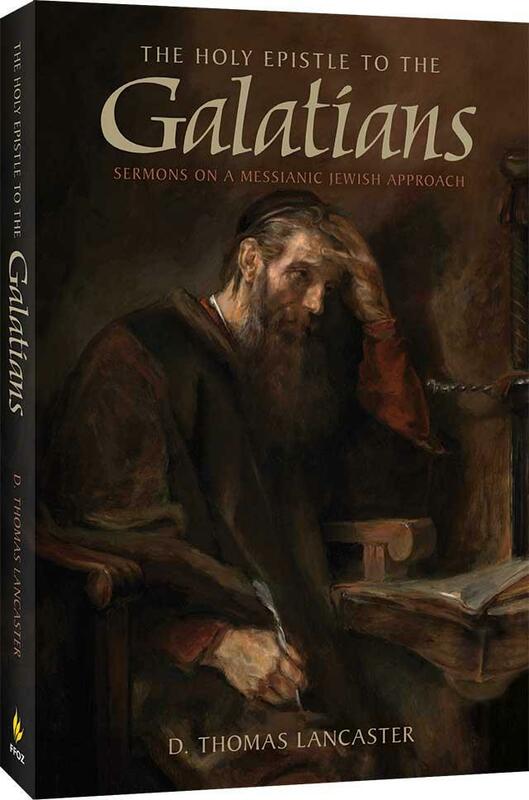 Mark Nanos is the author of The Irony of Galatians, The Mystery of Romans, and numerous contributions to the ongoing academic conversation about Paul and his relationship to Jewish identity and the Torah. Nanos is a pioneer of the “new perspective” on Paul. He is among a small handful of New Testament scholars who have challenged the old paradigms regarding Paul and Judaism. Whereas most interpretations of the New Testament set Paul in antithesis to Judaism and the Jewish people, Nanos sees Paul as a faithful Jew with a special mission to testify to Gentiles. Nanos is himself Jewish (not a Messianic Jew). Why is a Jewish scholar so interested in Paul and New Testament studies? What is “the new perspective on Paul” and how does it differ from the old perspective. 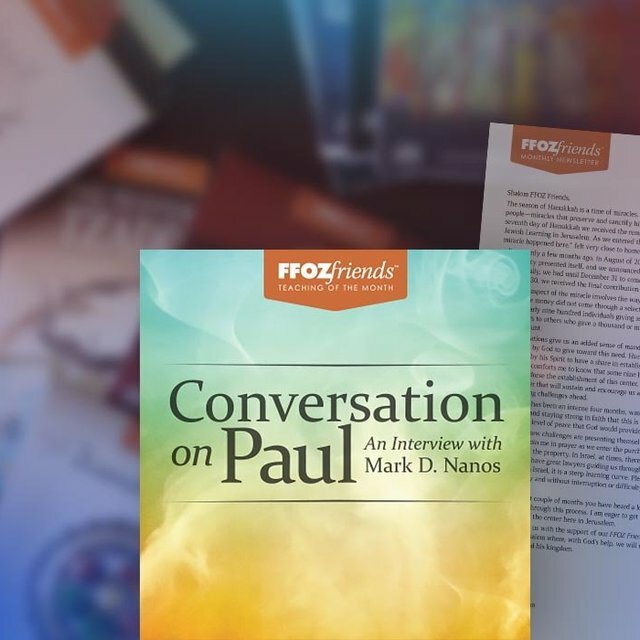 In the January teaching of the month, FFOZ Director of Outreach Ryan Lambert conducts an audio interview with Nanos and asks him to explain the revolution that has taken place in the interpretation of Paul’s writings. Find out how the academic world is slowly beginning to recognize Paul as an observant Jew within Judaism and not an apostate trying to start a new religion. The accompanying FFOZ Friends newsletter features a story about a great miracle at the end of 2016. On the morning of the seventh day of Hanukkah, we received the final remaining funds necessary to purchase the Bram Center for Messianic Jewish Learning in Jerusalem. We could clearly see the hand of God at work, up to the last minute. The article features some beautiful pictures of the Bram Center’s new lecture hall, the aron kodesh (Torah ark), and the Torah scroll. Another story in the newsletter tells about how, over the last few days of the year 2016, First Fruits of Zion’s 12-21 youth initiative hosted a Hanukkah Shabbaton and New Year’s Eve party for Messianic Jewish and Gentile youth ages twelve to twenty-one. Kids from all over the country attended and learned with us about the role of miracles in Yeshua-faith. If you are not an FFOZ Friend, consider joining the circle. Your support really bears fruit! You will receive our monthly newsletter that keeps you up-to-date with our work in Israel and the world, a free teaching of the month, quarterly Messiah Journal, full-color Messiah Magazine, and many more benefits, including online access to all previous teachings of the month. More importantly, you will receive the satisfaction of joining our mission to bring Messianic Jewish teaching to Christians and Jews.